Kirk Lundbeck received his Bachelor of Music in 1981 with an emphasis on trombone performance and continued his studies in trombone and instrumental conducting through 1983. Kirk has performed with the Rockford Symphony, the Elgin Symphony and the Kishwaukee Symphony. He serves as Associate Principal Trombone for the Symphony of Oak Park/River Forest and also serves as an extra with the Chicago Symphony Orchestra, a position he has held since 2004. Often sought after as a featured soloist and clinician, Kirk free lances throughout the Midwest, is the former lead trombonist of the Shananigans Big Band, and is the founder of The Black Tie Jazz Trio which performs regularly throughout Northern Illinois. 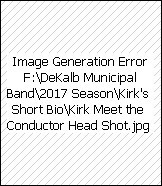 Kirk has been a member of the DeKalb Municipal Band for 41 years, served as Principal Trombone for 18 seasons and was selected as the new conductor of the DeKalb Municipal Band in 2012. In February of 2013, he was the first to be elected into the Sycamore High School Music Hall of Fame.